Acrylic, pencil, pen, miscellaneous collaged paper and a photo of a window. I wanted to try out working primarily with whites. I really liked. I’ve really been attracted more and more to simple and clean. But of course, not too clean- I had to scribble around this canvas with pencil! 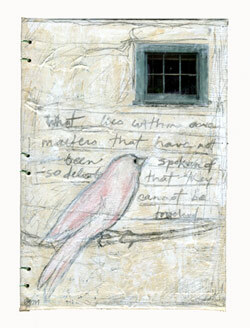 The writings that I add to my mixed media pieces usually all come from my own journals or poems/letters. I think that I was reading Noli Me Tangere by Jose Rizal and it influenced me when I wrote this. I believe it may have been in the prologue. Sometimes I feel a little strange sending out such personal pieces of me out there in the world. But isn’t all art-written, visual, danced,performed-all pieces or reflections of ourselves? this is just exquisite...so beautiful!